Philatelic Signatures – A short study on the Handwriting and Signatures of the Key Persons behind the British Postage Stamp and History. First I must say that this is only a short summary of the handwriting of some of the key people who fashioned the wonderful history of this countries stamps. Philatelic signatures can now command very high prices and it is therefore prudent to be able to satisfy oneself that the signature on offer is genuine. As there is only a small number of key signatures needed to form a relatively complete collection it is not particularly difficult to give an indication of essential things to look out for in determining that the signature is what it is. Roland Hill - the pioneer of 1d postage and inventor of the postage stamp. Without doubt at all this must surely be the most important signature on can own, being placed at the very beginning of ones collection , examples are always in great demand. Because of Hills very position in the story of stamps the number of signatures and complete letters in Hills hand are relatively large. The amount of correspondence he communicated during his life was sizeable but signatures are still very rare indeed and sell for high prices. The signature is the most popular and is easily identifiable. Hill often wrote his own letters but had various secretaries that wrote letters for him which he then signed. The signature itself can be authenticated from the examples I here illustrate. The ‘R’ is not always started with a round bowing. The names are invariably always joined and this point in the signature holds many characteristics which seldom change. Turning to Hills writing itself, short words such as IF, TO and THE, can easily be checked. Many T’s are not crossed and it is soon seen that Hills hand is very easy to recognise. James Chalmers - said by many to be true inventor and pioneer of postal reform. I wont here go into the intense controversy that surrounds Chalmers. Sufficient to say that he was a Dundee bookseller, very public spirited and very keen on postal reform and all the problems that went with it. An unsuccessful contestant in the Treasury Competition of 1839, much communication between Hill and Chalmers went on and books have been written with bias on both sides. 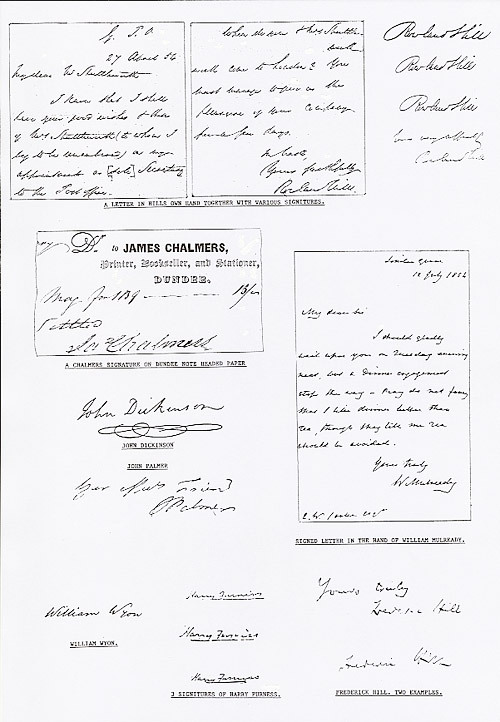 Chalmers therefore is certainly a very important character in the history of postal reform and his signature is without doubt the rarest and hardly ever comes up. As he had little to do with reform after 1840, the communications he made were relatively few, certainly fewer than Hill. Chalmers hand is again most characteristic and easily identifiable. His signature may be seen on Dundee Book Shop note headed paper which guarantees genuineness. William Wyon - chief engraver of the Royal mint between 1826 – 1851. Engraved the 'Wyon' City medal in 1838 to commemorate the Queens visit to the London Guildhall. The head of the Queen which appeared on this medal was used for the 1d black. Again an important signature and extremely elusive. William Mulready - the designer of the Mulready envelope. A painter of merit and student at the Royal Academy . An important signature as the collection of Mulready envelopes and lettersheets has always been extremely popular. Rare indeed and seldom seen or offered. Fredrick Hill - brother of Rowland, helped him through much of the early troubles in 1839 and played a productive part in the reform. A difficult signature to locate and an important hand. John Dickinson - inventor of the special security paper with silk threads running through it know as Dickinson silk Thread paper, used for the Mulready envelopes and for the later pre-paid envelopes. John Palmer - of Bath, mail coach pioneer who prepared a plan in 1782 for the reform at the postal service. Was later made controller-general of the post office. A well known name in the history of postage Not the most important but certainly one of the rarest signatures.